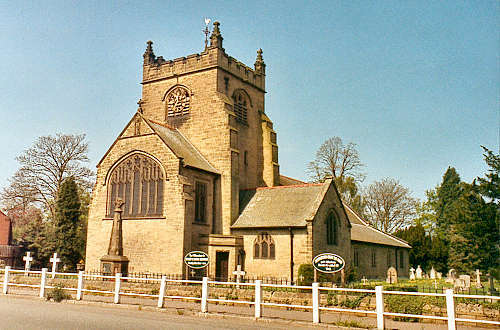 The parish of Rossett was created on 30 June 1840, from the townships of Allington (Trefalyn), Burton, and Marford & Hoseley, which until then had been in the parish of Gresford. In November 1851, part of the township of Gwersyllt was transferred from Rossett to the new parish of Gwersyllt. There is believed to have been a chapel of ease in Rossett in the early seventeenth century. Following the creation of the new parish, a new church was built in 1841. It was apparently of somewhat eccentric and inconvenient design, both inside and out. The foundation stone of a completely new building was laid on 1 May 1891, after the Vicar, the Rev. Vowler Wickham, had spent many years in attempting to have something done. He died just before the church was due to be consecrated; and he was buried in the churchyard on the day of the consecration - All Saint's Day, 1892. For family history information about the church and parish, visit the GENUKI Rossett page.